Healthy eating can be such a pain. All the slicing, dicing, and grating can take up so much time that it’s tempting to revert to old, unhealthy eating habits. That does not even include the cleaning part yet! But with the right kitchen tools such as a mandoline food slicer, food preparation can be done in half the time than it normally takes. With different blades, a mandolin slicer lets you do cuts of various thickness and styles. And it does that with one simple motion of gliding the food on the board and against the blades. Speed, convenience, and the ability to fetch you a uniform, solid cuts are what endear mandoline food slicers to those who love preparing healthy salads, fresh snacks, or home-cooked meals. Today, we’re looking at the Gramercy Kitchen Co. Mandoline Food Slicer. If you’re wondering how well this kitchen tool ticks off the speed, convenience, and cut quality departments, and some more, then this review is for you. This mandoline slicer comes with a control knob that lets you adjust the thickness of your sliced ingredients. With a turn of the knob, the Gramercy Kitchen Co. Mandoline Food enables you to adjust slicing thickness from 1 to 9mm. Need to julienne veggies or slice fruits? No need to fumble through your kitchen drawer to find the blade you need. The different blades of the Gramercy Kitchen Co. Mandoline Food Slicer are built into the device. With the straight blade, cut ingredients from 1 to 9mm in thickness. And to julienne produce, choose between the 4.5mm and 9mm julienne settings. Swapping blades and getting yourself hurt in the process is a thing of the past with this mandoline slicer. With it, you can prepare vegetable salads, potato chips, and more the safe and easy way. And made with top-grade 4CR15 stainless steel, the blades are made to fetch you solid, clean cuts for years to come. The Gramercy Kitchen Co. Mandoline Food Slicer sports a compact design. For good leverage, fold out the stand to prop the device on an angle. And to store, simply fold the stand back in. This kitchen tool packs to a 7 x 3.4 x 16.7 inch-size and tips the scales at 1.9 pounds. This mandolin slicer comes with a food holder where you impale produce for slicing to keep operation safe and smooth. On top of that, it also thoughtfully added a pair of cut-resistant gloves for extra protection, especially during accidental hand slips that may send an unfortunate finger towards the blades. Besides easy and safe operation, this mandolin slicer aims for thorough and bloodless cleaning. 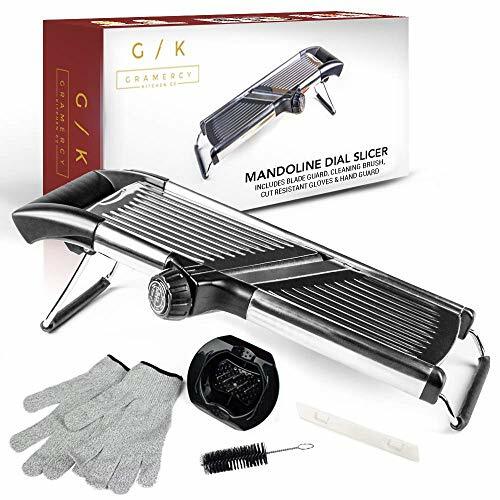 The Gramercy Kitchen Co. Mandoline Food Slicer is equipped with a blade guard and a cleaning brush. And if you don’t like cleaning the device by hand, then you can also just pop it into the dishwasher. Want to maximize the use of this kitchen tool? Learn different recipes you can whip up with the Gramercy Kitchen Co. Mandoline Food Slicer. Your purchase grants you free online access to their collection of recipes. If you’re happy with the product-in-review but find the price tag off your budget, then the more affordable Chef’s Inspirations Premium V-Blade Mandoline Slicer might be the one for you. And with its six swappable blades, it might just have the cutting options that most of your cooking requires. While the Gramercy Kitchen Co. Mandoline Food Slicer uses a built-in interchangeable blade system, this one requires you to swap between six different blades. You have three thickness options for slicing: 1.5-, 2.5-, and 3.5-mm blades. Quite limited compared to the product-in-review that allows you to make thickness adjustments in 1mm increments for slicing. There are also two julienne settings for this mandolin slicer; one is for 3mm and another for 7mm. If you find the Gramercy Kitchen Co.’s 4.5- and 9-mm julienne blades too big for your needs, then perhaps the Chef’s Inspirations Premium V-Blade Mandoline Slicer is a better match for you. Plus, you’ll get a grater with this one, which is, unfortunately, missing in the Gramercy Kitchen Co. Mandoline Food Slicer. Another product worth a look is the similar-looking ELYX Mandoline Slicer. From the stainless steel construction and collapsible design down to the built-in blade system and knob control, it’s basically the same with the Gramercy Kitchen Co. Mandoline Food Slicer. The marked differences are just the absence of the complimentary cut-resistant gloves and the price. If you’re looking for a well-built and well-designed slicing aid in the kitchen, then the Gramercy Kitchen Co. Mandoline Food Slicer offers you a good return for your money. The built-in interchangeable blade system makes food preparations super convenient and easy. With it, you can finally say goodbye to having to swap blades and running the risk of cutting yourself in the process! However, the same system comes at a disadvantage, especially if being able to do different tasks with your mandoline slicer is a requirement for you. If having a wavy blade or at least a grater is something you want your mandoline slicer to have, then you’ll have to keep looking. But if being able to adjust slicing thickness is a greater priority for you, then you should find happiness in this one that allows you 1- to 9-mm settings in 1-mm increments. Another thing to love about the Gramercy Kitchen Co. Mandoline Food Slicer is that it understands how things can go awry in the kitchen. Thus, it has added features in the product that will make operation, storage, and cleaning safe for you.